In this history/memoir, former Obama Secretary of Education Arne Duncan offers one person’s wordy perspective. 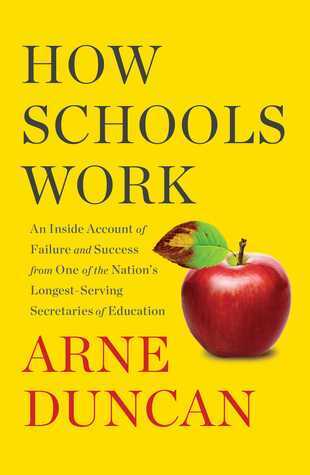 Even the title is discursive: How Schools Work: An Inside Account of Failure and Success from One of the Nation’s Longest-Serving Secretaries of Education. Duncan made his bones as the CEO in the Chicago Public School system. He became a part of President Barack Obama’s Chicago contingent after successfully implementing mandated community service for students and setting up system-wide after-school programs. Duncan’s experiences in Chicago are rich and dense, but he warns us, “I could write a whole book about my time at CPS (Chicago Public Schools), although I’m not sure how many people would read it.” Probably those interested in education, its problems and solutions—the same population that might read this book. Elaboration on the futile attempts to change the system appear throughout—George W. Bush’s No Child Left Behind and the Obama administration’s Race to the Top aka Common Core. He diagnoses their well-publicized failures but quickly adds, “Race to the Top changed the educational landscape in America.” He briefly addresses the notorious scandal arising from that program, the teachers who faked test scores so they, too, could “race to the top.” It was a systemic problem, he admits, but it wasn’t feasible to fire all the teachers involved; there were just too many. Instead, the Duncan’s Department of Education focused on “the most egregious” ones and closed consistently underperforming schools. Many of his vignettes are intended to advance the notion that poverty is not destiny, and are probably the strongest sections in this wandering book. His efforts, especially in Chicago, are discussed at length but are later overshadowed by the seemingly overwhelming demands accompanying his national position. He documents well the assertion that the quality of education depends upon where the student goes to school, an advocate for muscular national standards. Sadly, the book is riddled with so many dialogue-heavy stories, anecdotes and an ever-shifting focus that it can become a laborious read. With its long, unbroken paragraphs and distracting asides into his personal history, it’s a bumpy trip laden with informational clutter. For instance, he tells us that he and his Department of Education staff always flew coach. He enjoyed being recognized by “civilians” as the Secretary of Education riding in economy, as if his seat choice were an act of nobility. Never mind the fact he was habitually chauffeured around town in a limo. There’s an underlying faux-modest tone of “I’m just a regular guy” here. On his first day on the job in DC, he asks his employees to call him “Arne.” Why do we need to know that? In unraveling the lies educators tell, he is critical of magnet schools because their advocates, too, have been deceptive. Some of them don’t provide the specific kinds of classes advertised, misleading everyone. Truth in advertising would seem a minimum expectation. A timely discussion would have been welcome about the etiology of their emergence in the 1970s as a less controversial facilitator of integration, offering specificity in education and training. The book might have been more compelling had he connected the rise of our polarized society to the de-emphasis on teaching critical thinking in public schools. But he’s more inclined to digress into school shootings, the many funerals he funded as CEO, low expectations of minority students and the lack of adequate pay for teachers. They are all important issues but his exploration is so scattershot, it diminishes the intended clout. Some equally essential issues are minimized or completely omitted, such as the impact of the rise of charter schools, home schooling and the rush to online education. What about the social penalties incurred by the exorbitant cost of college, selecting out many potentially valuable contributors to society? Recent statistics from the ACLU reveal that education is in a dire state of transformation and crisis. For the first time in history, public schools in America are serving mostly children of color. Students who missed school in 2015-16 because of suspensions – disproportionately students of color – were denied a total of 11 million days of instruction. Millions of students are in schools with cops but no counselor, social worker, or nurse. The book seems to veer between impenetrable statistics, collegial conversations and lapses into familiar clichés. His goal, he writes, was not just to raise scores or increase high school graduation but “to transform American lives for the better.” Do we really need to be told that “love, support and high expectations” can enable a kid to succeed? It isn’t until the last third of the book that he mentions—almost in passing—that the fact he had never been a classroom teacher might have impaired his credibility with the educational community. This seems to be significant information but he doesn’t think so. He tells us he has always thought of himself as a teacher, as if that should sufficiently satisfy his critics. In the final section, he writes, “Ensuring that we have a strong education system is the only way to build a strong and vibrant middle class…It isn’t only the future of our children that’s at stake. It is the future of our country.” One wishes these pithy observations had appeared at the start of the book, instead of the lengthy discussion of his basketball aspirations. He offers too many “Gee, I didn’t know that” moments that leave the reader with a pointillist perspective without any meaningful takeaways. Duncan’s book is drowning in detail and self-evident statements like “Ultimately, schools won’t work if we refuse to believe in them or in their power to change lives.” If this is intended for a lay audience, its tall verbal cotton will be a daunting deterrent. In a time when learning and academics are under siege in Washington and elsewhere, it’s disappointing that this book does not confront the implications of the shape-shifting attacks by the current administration. A more unified literary approach might have brought his many themes into sharper focus, reflecting a greater sense of urgency.